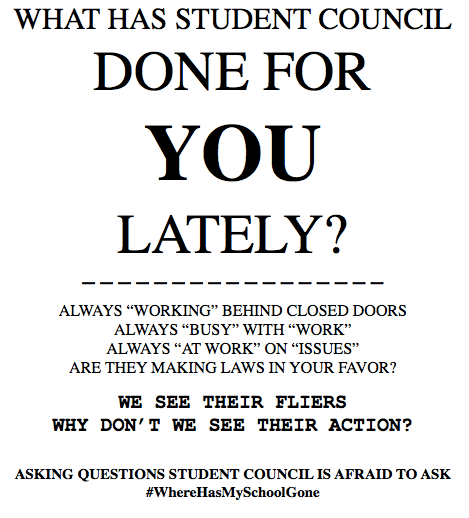 What Has Student Council Done for You Lately? Posters with this slogan were anonymously plastered around the school on Wednesday, November 30th. In an attempt to make Student Council seem hidden and corrupt, the posters revealed something important: most students have no idea what Student Council is or what it does. For those TAs who responded to the surveys, only 44% responded yes, and only 60% of those who said yes were sure of their answers. That means that only about a quarter of the student body really knows what their own Student Council does. Another question in the survey asked students to use three words to describe the school culture and climate. 49% of TAs chose words with negative connotations, such as boring or stressful. 44% chose positively connotated words, such as accepting or fun. What do these results say about how we are building the culture of U-32? While Moody did say that the Council has gotten students involved in the community, as with the recent Clothing Drive, she also said that there wasn’t enough communication between the school and its students. This realization prompted Looke to get involved and run for Student Council. He began a long-term Student Voices committee right off the bat in his new position. He also designed the recent survey that was distributed to TAs. The Council hopes that they can increase dialogue between Student Council Representatives, like Looke, and students, like Moody, who have a lot of ideas for how we can improve our school for the better. The Student Council highly encourages students to attend meetings, which take place every Wednesday morning at 7 am in Kit Walker’s room. Students are welcome to observe, or bring an issue to the table. Visit the Student Council Website to see more specifically what Student Council does, upcoming events, agendas, meeting minutes, or to make an online suggestion.